Occasionally some of our clay pots in gardens get broken. It is inevitable that some throw them out and sometimes it happens that people try to use by recycling broken pots. When this happens we have two choices, either throw or use by recycling broken pots. Through this article I will show you the best ideas to give a second life to items already in used. High temperatures or passage of time can make our pots broken. But if we want to use broken pots by recycling, there are number of possibilities. The most common that I have used is to use it by drawing on the background of broken pots. Apart from it we have much more original and decorative ideas. We can use again the broken pots as a planter, but how? I’m going to point out several options. 1. If you have a garden or lawn or a place in your home, can put half broken pot on the ground with soil, pretending that the rest of the pot or the missing half is buried. This original idea gives us an option of a combination of flowers, putting one on top of the pot and the other on the bottom, prolonging the feeling that when the pot is broken, its contents are spilled out. 2. Make your collection of broken pots and place them on a large ceramic dish creating a composition with them all. You can add different types of plants that do not need too much water, in each of the pots to create a colourful and original composition. 3. To recycle a pot that has been shattered, literally, you can take all those chunks to bond into a single pot with flowers or can paint it, can make mirror or even a Christmas wreath, you can also add dried grass or other dried plants to give an original appearance. 4. If you have persistence, imagination, also you’re good craft person, can also create a miniature garden using the remains of broken pots, soil and some miniatures. You can also decorate little things with flowers in broken pots for giving a natural look.You can also add other decorative elements such as houses, toys, rocks and of course don’t miss soil plus plants, but as always with a more personalized and innovative touch. 5. You can also make a water container by recycling broken pots in the form of pieces. You just need to arrange the pieces properly so that if water can run into the garden via broken pieces. Don’t forget to put soil as well as flowers into the water container. This will add more charm in your garden. 6. 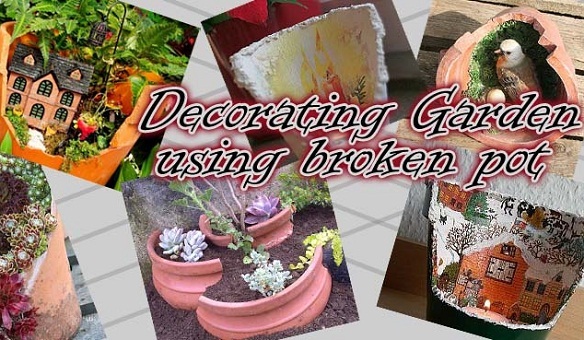 The last option for recycling broken pots is, use them as part of a decorative composition with other materials. You can use some white concrete along with other pots. Decorate them along with broken pots in one corner of your garden. But your decoration should be valid. « How to make eye-catching DIY gel candles » Red lipstick and Eye makeup: How to contrast perfectly?